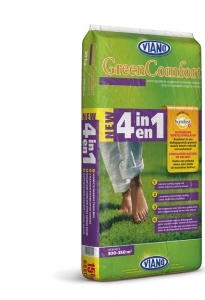 Viano Organic Lawn Feed 4in1 is a new, well balanced organic- mineral fertiliser with a unique composition with extra Humifirst (mixture of humic acids) and magnesium. Proven ideal for the formation of a dense turf.. This product contains Humifirst, a mixture of humic acids and fulvo- components to optimize root formation and the strong establishment of the seeds and grasses which results in limited development of weeds in the lawn. 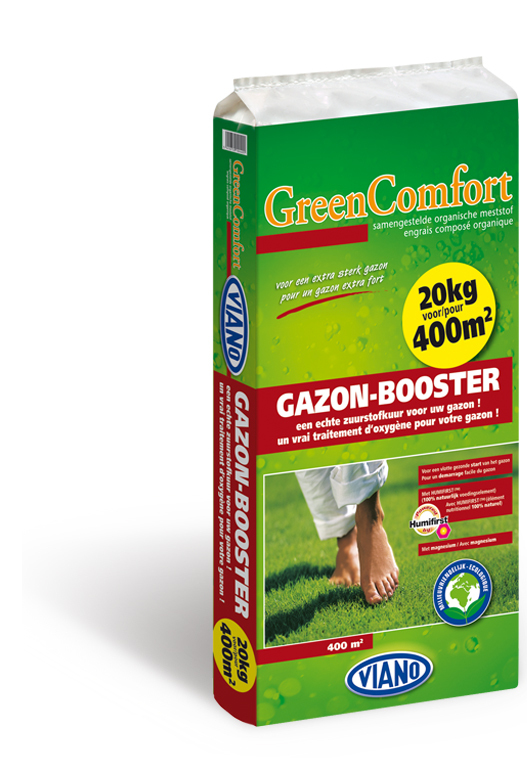 Viano Gazon Booster is an organic mineral fertiliser enriched with Humifirst (humic acids) and magnesium. It guarantees a very strong turf an can be applied during construction (preseeder) and maintenance. 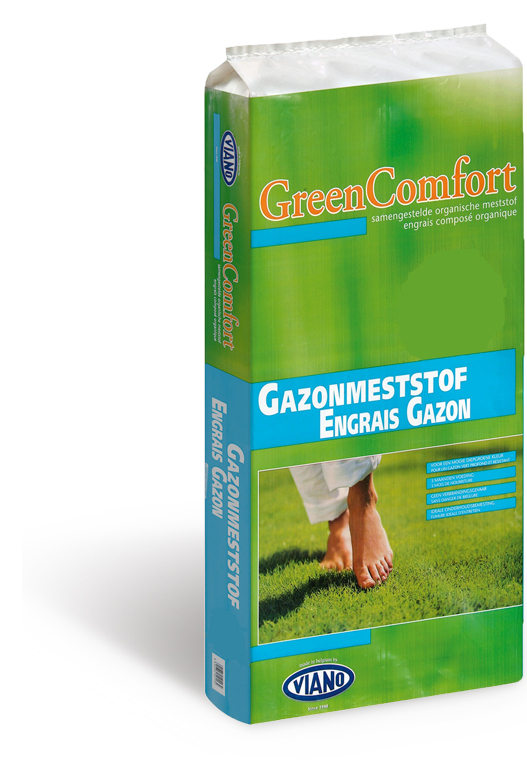 Gazon booster accelerates the new growth and germination of grasseeds. The presence of the humic acids makes the uptake of the nutrients easier for the plantroots. With rapid action. Viano Gazon Booster can be applied till october. Can be applied after scarification or on poor “established” zones. Works up to 3 months. Well balanced organic- mineral fertiliser with a unique composition. Proven ideal for fertilisation after scarification or to apply as preseeder. The presence of magnesium guarantees green vivid colours. This product contains Humifirst, a mixture of humic acids and fulvo- components to optimize root formation and the strong establishment of the seeds. Can also be applied in combination with vertidraining. Viano Recovery works up to 100 days. Applied to lawns with a lot of bald spots. is indirectly inhibited in growth. VIANO M.O. NUTRITION does not makes stains on tiles, terraces and concrete. It prevents the formation of new mosses in lawns. This fertiliser works up to 3 months. Does not contain decomposing bacteria. An organo-­ mineral fertiliser in crumbs with long action. 3in1 anti-­‐moss action based on the presence of Ironchelate and Ironsulphate. Does not stain on tiles, concrete and clothing. Enriched with useful bacteria who decompose the organic waste ( thatch) into lawn feed. Can be used at lower temperature. Works up to 3 months. 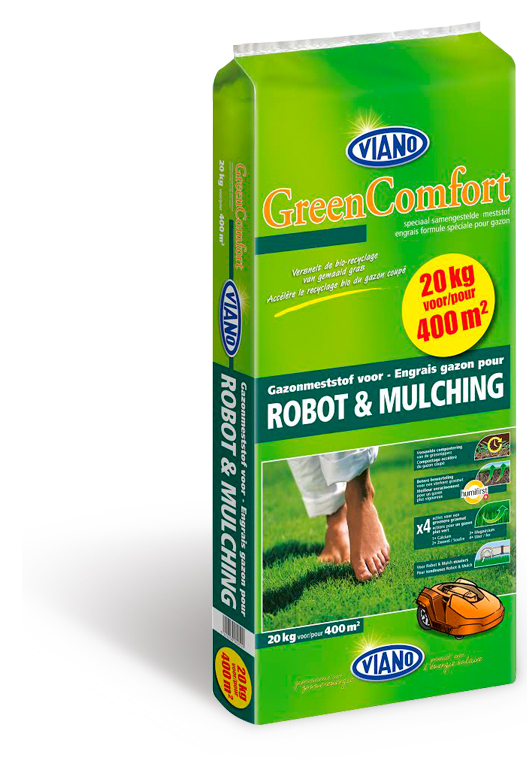 Viano compound fertiliser for use in combination with robotmowers and mulchers is specially composed for lawns which are maintained by robotmowers. This slightly acid (contains Sulphur) working lawnfertiliser speeds up the transformation of the cutted grass due to the prescense of useful bacteria and the high N content. The presence of phosphorus,calcium, magnesium and Humic acids (Humifirst) guarantees a healthy and very strong turf with dense colours. Apply this fertiliser once in spring and a second time in early summer. 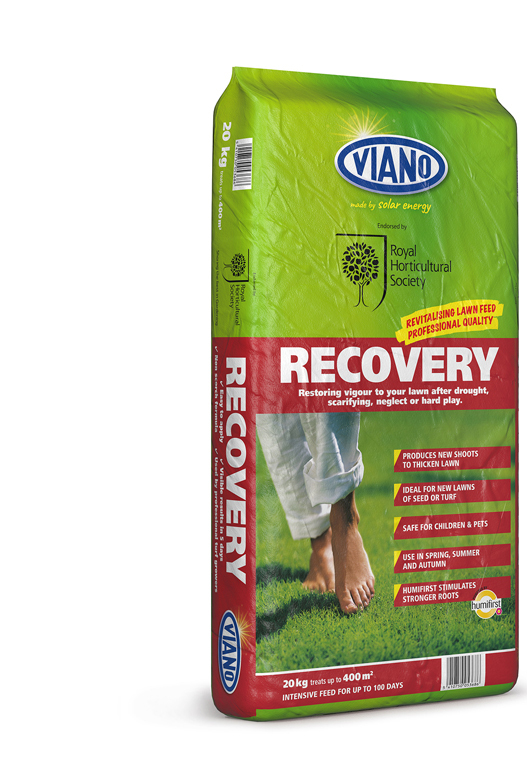 Viano lawn fertiliser is an organo-­ mineral fertiliser suitable for each type of lawn. With extra magnesium for vivid colours. 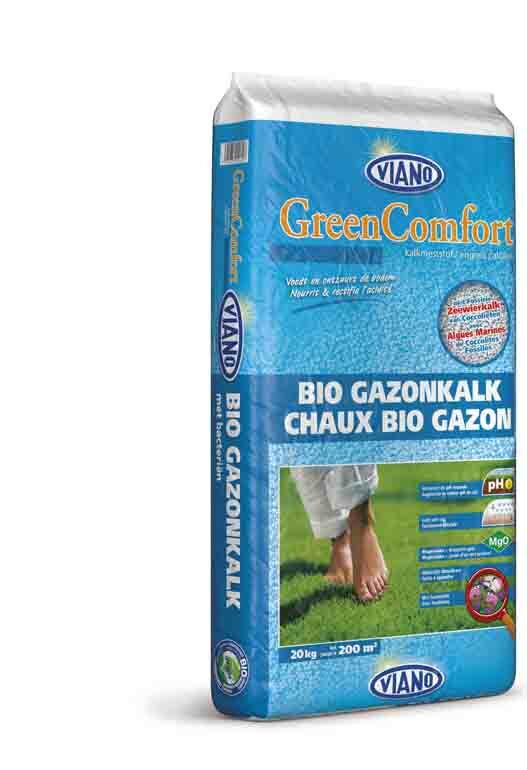 Viano lawn fertiliser can be applied for construction or during maintenance of lawns. This fertiliser contains fast acting components to guarantee immediate and long lasting effect. This formula enriches the root zone with organic matter and increases soil fertility. Works up to 100 days. 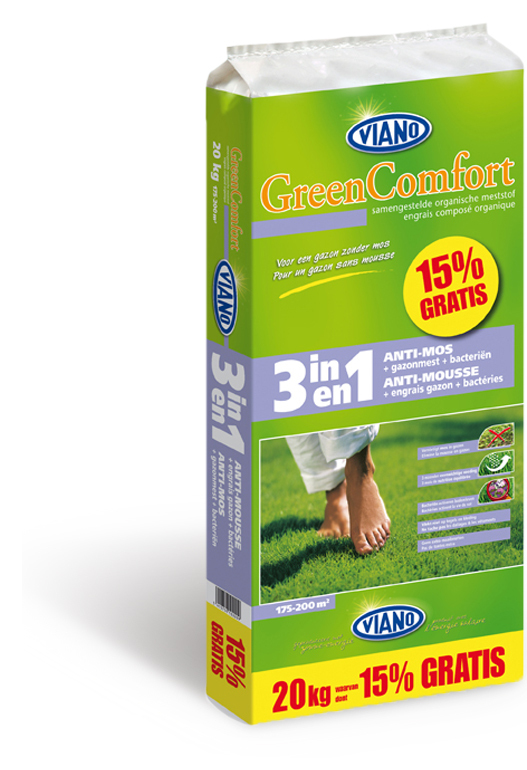 Viano lawn fertiliser+ lime is an organo-­ mineral fertiliser suitable for each type of lawn. With extra magnesium for vivid colours. 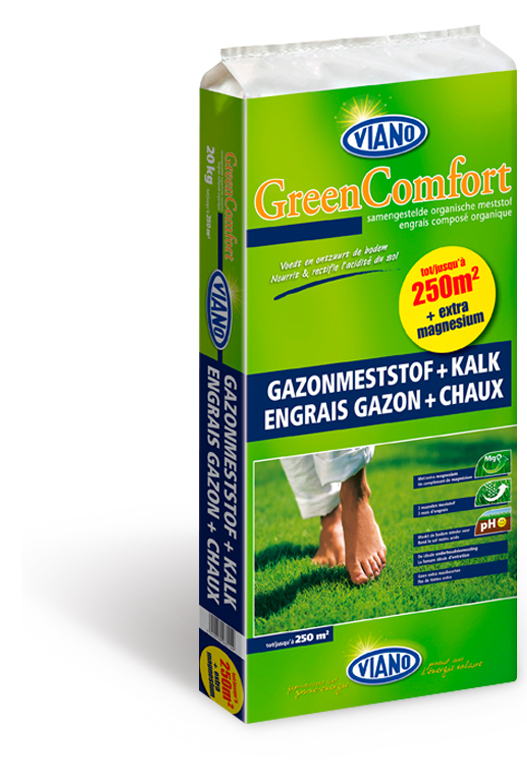 Viano lawn fertiliser+lime can be applied for construction or during maintenance of lawns. This fertiliser contains extra lime and works indirect & pre- emptive against mosses and makes soils less acid. The fast acting components guarantee immediate and long lasting effect. This formula enriches the root zone with organic matter and increases soil fertility. Works up to 100 days. 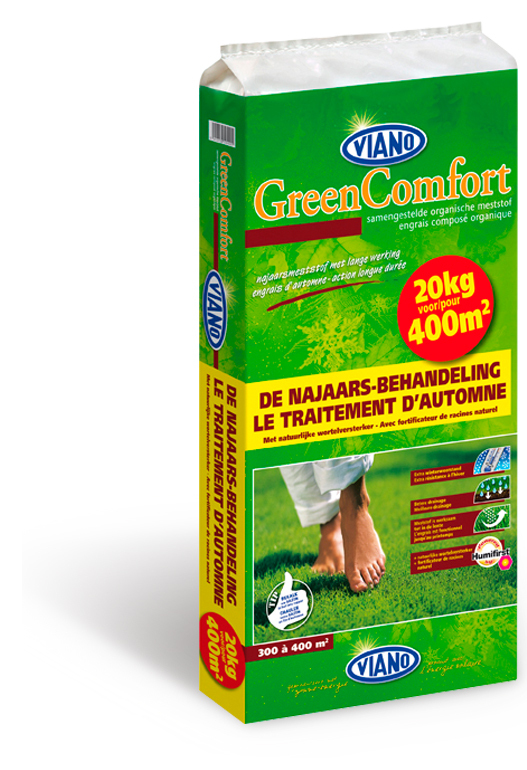 Viano Autumn Treatment is an organic based fertiliser for application in colder periods (autumn). 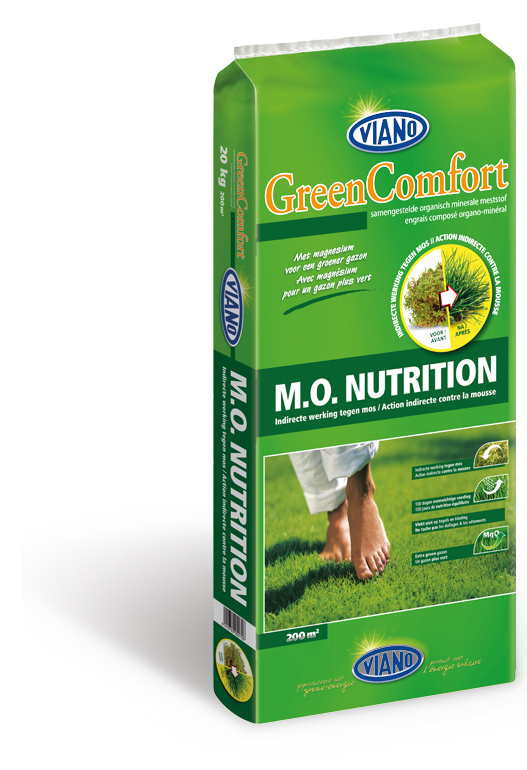 Contains extra magnesium for green colours through autumn and wintertime. Can be used till the end of the growseason, together with mechanical care. Less risk of leaching. Application of this fertiliser results in a stronger turf with better condition for next spring. With the presence of Humifirst (humic acids) the uptake of the nutrients is optimized. This results in an increased efficiency of the fertiliser due to a better root development. Specially compound soil improver for the construction (preseed) of grasses and the repair of bald spaces. Viano soil improver for lawns is applied after scarification were it improves the germination of grasseeds during seeding. It optimize rootdevelopment (preseeder) and assures a soil that is easy to cultivate. 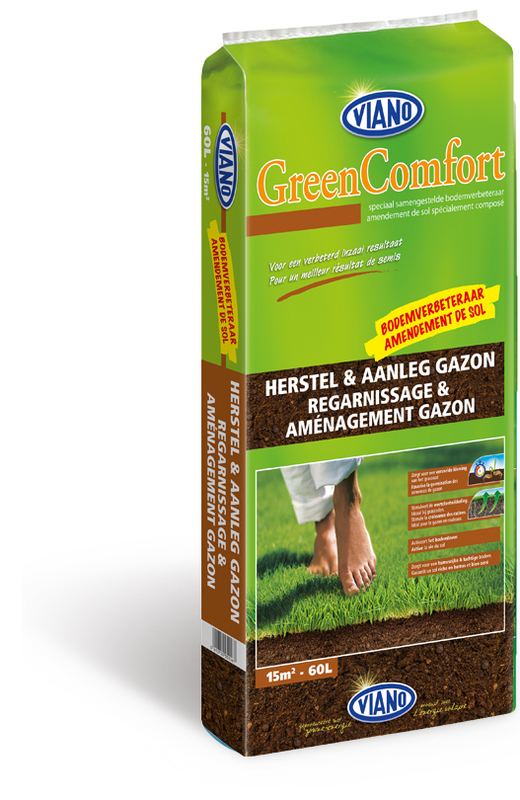 Organic soil improver containing garden peat, peat and compost. Viano BIO- Press is a compound liquid fertiliser which is 100% natural and entirely from vegetal origin. Due to the specific composition of the product and the liquid form, this fertiliser has an indirect effect against mosses in lawns. After treatment, the moss will turn brown after 24 hours and dies of. 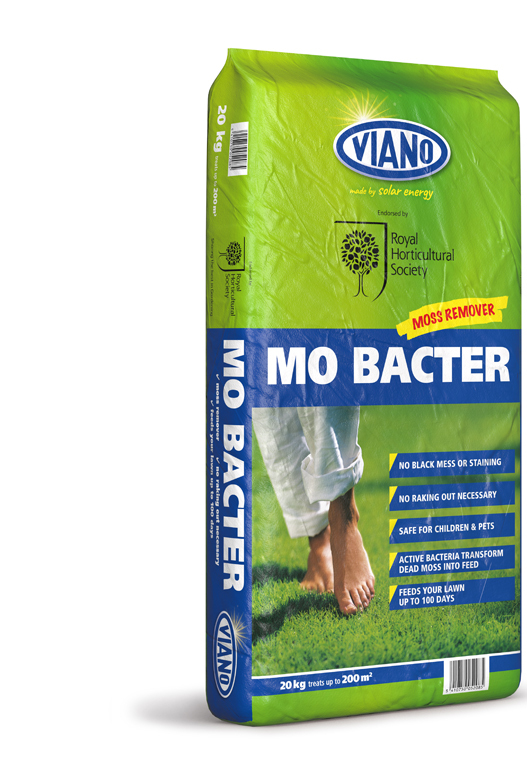 The grass will benefit from the nutrients and will grow over the place where moss was present.Viano Biopress is the ideal preparation before scarifying.